In honor of Manatee Appreciation Day, celebrated on the last Wednesday of March, we thought we’d share some of our favorite manatee facts and how you can see manatees for yourself right around Sanibel Island. They spend half their day eating! Even though manatees primarily eat leafy greens, they can weigh up to 1,200 pounds. Just like our visitors, they love Florida weather. Our mild winters and warm waters are perfect for manatees to enjoy year-round; manatees prefer warm waters and cannot tolerate water temperatures below 68 degrees for long periods of time. They head to the surface every three to five minutes to breathe but they can stay submerged up to 20 minutes if they need to. Manatees are known for their gentle nature and they like to surf or barrel roll when playing. While manatees usually swim at about three to five miles an hour, they can reach almost 20 MPH in short bursts. Lighthouse Beach Park: Located on Sanibel Island’s southern tip, this area is a great place to try searching for Manatees on your own by looking for those circular ripples on the surface of the water. 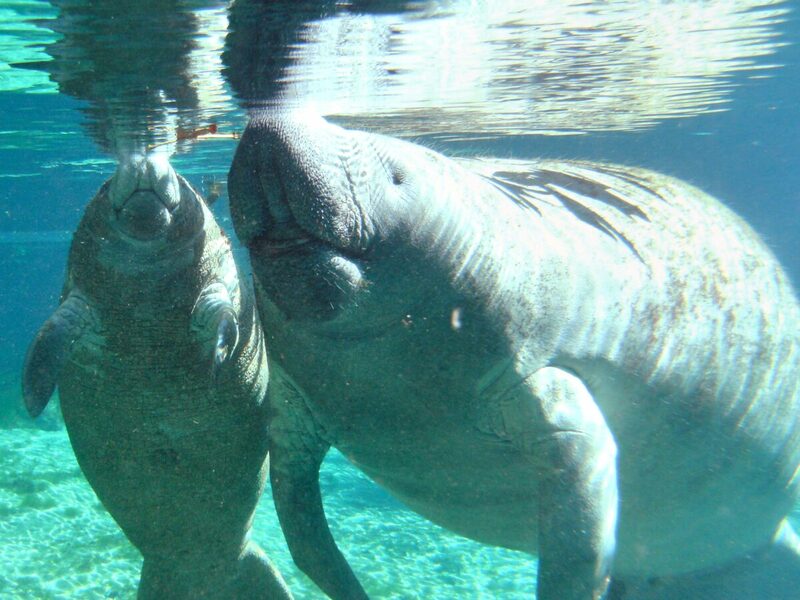 Manatee Park: A unique park where visitors can view Manatees in a non-captive and natural environment, Manatee Park features visiting areas, picnic shelters, and kayaking/canoeing on the Orange River. Manatees are drawn to this particular spot because the nearby FPL compound keeps the waters extra warm. Tarpon Bay Explorers: See wildlife up close and discover the J.N. “Ding” Darling National Refuge with an experienced naturalist by your side. Tarpon Bay Explorers has many tours designed to be both educational and fun. While on the tour, search for manatees, dolphins, alligators and more. Ever been manatee spotting around Sanibel? Share your favorite spots with us!